Do you know that feeling that your energy has been cut into a million pieces? That you have lost pieces of you everywhere? I had that today. And I’m going to tell you about it. Today is day 4 of the 30 day blogging challenge. I’m sitting on my couch, drinking my herbal tea (which is actually called “Dreams come true”!). I’m thinking what I am going to write about today. I would really love to do 30 days of blogging, for many reasons. One of them is that it's so much fun to do! But I feel tired. I was tired today and the afternoon was very weird so it made me a bit more tired. And really all I want to do is go to bed and sleep… But, no blog today, can I do that? Do I want to do that? So I thought about posting into the Facebook group about why I wasn’t going to do a blogpost today. Explain my day. And then I thought “What if I make that a blogpost?”. Of course this blogpost is not only about my day and me being tired. 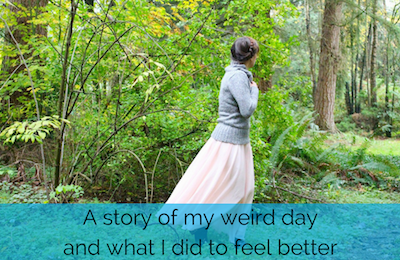 It’s about me, why I had a weird afternoon, and what I did to feel better. And I love telling stories, so here’s the story of my day. Today I woke up from a kiss… it was as if I had landed in a fairytale: I was sleeping beauty and my boyfriend was the prince…. It was like magic! Until the moment he started talking: “Your alarm is ringing”. Alarm?! That’s not supposed to be in the fairytale! And to be honest, I didn’t feel like I had been sleeping for years. I could really have slept for hours more. But hey, I had to go to work and I had a little girl to bring to school. So, back to reality. The day at work was OK. I felt my cheeks were red and I did feel a bit sleepy, but I felt very relaxed, and enjoyed my day. After work, I had to go to my son’s school to pick him up, and then to my daughters school to pick her up. There’s 30 minutes difference in the time their schools end, so I had really enough time to pick up both. But there I was, at my son’s school, waiting. And waiting. And waiting. After 15 minutes, I got out of my car and went to search him. I saw another mom and she told me that the class hadn’t returned from their excursion. OMG, I started thinking what was the best thing to do. Because I had to pick up my daughter as well, and it was really time for me to leave. My head was spinning. My son could go to someone who lives near the school, but how would he know he should go there? Would he understand that I had left to pick up his sister first? When I was thinking and thinking and thinking… the class arrived. Finally! All is well, I thought. Until the teacher saw me. She immediately started talking to me: “Ah you’re there! Have you heard! You should see the director, have you seen the director? He’s called you right?! So you know what happened. What?! You don’t know what happened?! It’s bad! Well, he’s OK, so don’t worry, but you should talk to the director!”. Ehm… my head already was spinning in one direction, now it started spinning in another direction, and… much faster. OK, so he fought with another boy, it was bad, he’s OK now, I have to pick up my daughter, but I have to talk to the director first, I haven’t seen my son yet, is he really OK? How will I reach my daughters class if the other day they didn’t even get the message that she was sick, will they get my message that I’m late? I’ll call her teacher on her mobile, oh no, her school hasn’t finished yet, oh and my aunt is visiting me this afternoon, have to tell her I’m late as well, but first go to the director”. Fortunately she was with her teacher, who found it necessary to lecture me about how I shouldn’t write e-mails to the teachers, but write hand written notes, and how most teachers really don’t appreciate if you use their mobile numbers, and then repeating me that for her it was not a problem. After hearing this about 3 or 4 times, and explaining why I handled like this (even showing my sons wounds from the battle, hahaha) I finally got to go home…. At home, both kids were busy talking about their day, I drank tea and talked with my aunt (who just came a little later so she was sure I was home), and when everyone had left (my kids went to their dad) I felt as if I had left pieces of me everywhere. As if my energy was cut into a million pieces. I felt a bit lost without these pieces of me. And my energy felt like a complete mess. Here’s what I did to feel better. 1. First of all I took a shower. It really helps me clear my energy. 2. I asked Archangel Michael to cut all cords that had linked to me today. 3. I asked Archangel Rafael to clear my energy even more. 4. I asked all the pieces of me that I had lost today to come back to me, so I could feel whole and complete again. 5. I did some healing and clearing for my energy with the intention of having a clear energy and feeling in my power again. After that I felt way better! It’s magic all the things you can do with energy and intention. Of course I was still tired. But that was OK. I hadn’t been working on that and I didn’t think it was important. It’s OK to be tired sometimes. But my energy felt clear and complete again and I enjoyed my evening after that. What do you do when you feel like this? I would love to read your magical solutions! You can also join my free Facebook group and tell me about it there.